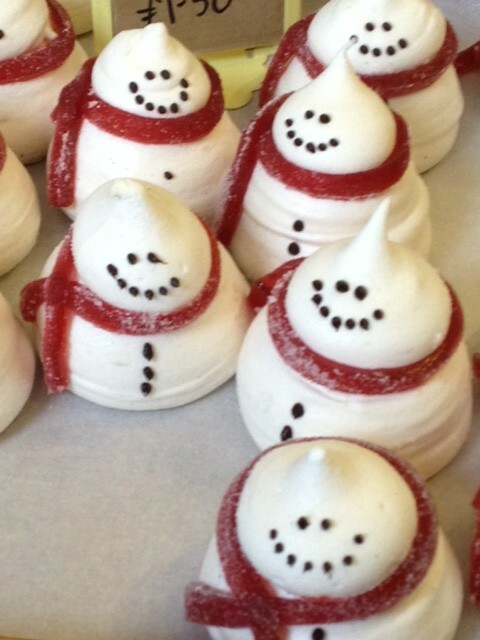 Today, I was walking through, The Selfridges Food Hall, and I came across these little cakes. Tomorrow night we are having friends over for dinner. I said I would cook if they would provide some help to me on something else. Anyways, I thought these would be a perfect treat to have at the end of dinner. 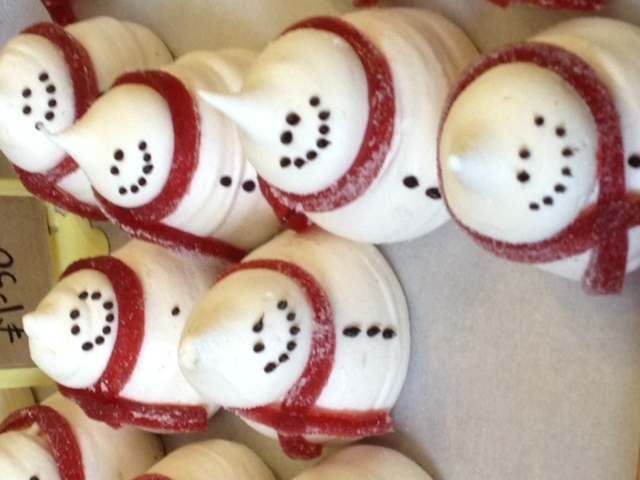 They are called the Original Magic Cakes made by Konditor & Cook. The fabulous Sparkle Heart Shaped plates were purchased from Target a few years ago! This past weekend, a friend of mine learned the horrible lesson, even if an appliances is off it needs to be unplugged. She was making a ricotta spread and got a clump stuck in the blade. Â While getting something out of the blade of the Emulsion Blender, the blade activated.Â This lead to the two of us spending the evening at the ER instead of indulging in the ricotta spread. Luckily, only five stitches were needed! Just a reminder to always unplug electronics, especially when there are blades involved! I am back!! Over the past months, I have thought a lot about my blog but, to be honest, lacked the inspiration/hope, Â felt that there were just so many blogs out there, and that cooking was some fad. But, I realize I have always been happiest in the kitchen, whether cooking for myself or for people I love.Â My personality has always been an open book, so I will continue to share my thoughts and what I find interesting with anyone who is interested in reading. Along with many hours spent in the friendly skies. Â In the kitchen, I have been interested in flavor pairings and pasta. I love pasta and restaurants make it look so easy, so I thought it would be fun to start making my own pastas and working on sauces. And I was correct — I have had a lot of fun working on my pasta! 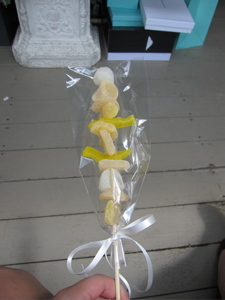 What fun it would be to do a course on Pastas and Gelatos inÂ Italyâ€¦.Oh, how a girl can dream! As some know, I have a tendency to be a little over the top. When I entertain, I make three sauces instead of one. I just get so excited to cook for others that I get carried away. But then there are times when I keep it simple, and am so delighted by the result.Â Chicken Paillard is one of my favorite dishes to order. It is clean and simple, with so many simple variations. 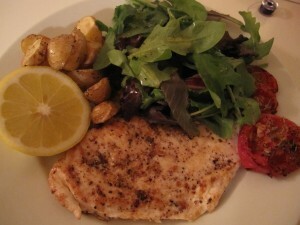 Recently, I made it and served it with: Slow roasted Tomatoes, (or speed the roasting and just increase the temperature) RoastedÂ Fingerling Potatoes, Mixed Greens with a Lemon Vinaigrette, and a Lemon Wedge. Everything, except searing the chicken, could be done in advance and served at room temperature. Take a boneless skinless chicken breast and pound it out until it is about 1/3 inch thick, salt and pepper both sides. This can be done Â earlier covered and place in fridge. Heat frying pan with a little bit of vegetable oil and cook chicken both sides about 1-2 minutes on each side. Now it is ready to be served. Perfectly simple and something that everyone will enjoy! This dinner was finished with chocolate sundaes. To make them a little more exciting, Â I went to a local ice cream store where they make fresh waffle cones and bought four waffle cups! Here is a great classic recipe for a simple rolled cookie. Yes, any cut out cookie does take a little bit more work than a drop cookie. One way I cut a corner with these cookies is that instead of frosting them, I just dipped them half in chocolate. I found this fabulous sparkle plate at TARGET. I was so excited I bought 8. In a mixing bowl, beat together the butter, Crisco, sugar, and vanilla. Flowed by adding the egg and whipping until light and fluffy. Mix in the milk and then stir in the flour and baking powder. Divide batter into three equal parts and wrap in plastic wrap and refrigerate for at least one hour. On a floured Surface roll out one of the parts of dough to about 1/8th inch. 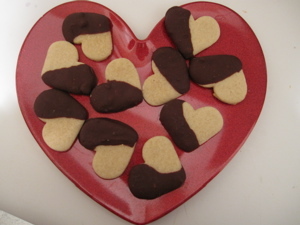 With a cookie cutter cut the dough with the cutter and place on baking sheet. Bake for 6 minutes. You can eat them as is, sprinkle with sprinkles before baking, ice after being cooled or dip them in melted chocolate as I did. 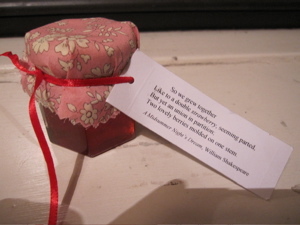 Earlier this summer I was at a wedding and on the table was this little jar of strawberry jam attached with a quote. The bride and her mother had made the jam. I thought it was so perfect, sweet, thoughtful and a wonderful idea. So in case anyone is looking for a favor idea, I thought this was a great one! Last weekend I was at the farmer’s market, in Union Square buying some blueberries because I wanted to make the August cover of Gourmet. Lemon Blueberry Ice Cream Bars- they turned out great and think they would be perfect to serve at a summer BBQ. While I was walking through the market I discovered Mexican Sour Gherkins. 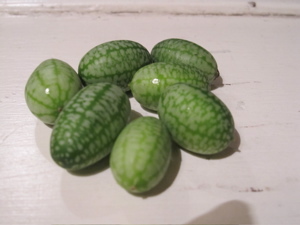 They look like mini watermelons about 1 inch in size but taste like a cucumber. It is now days later and I am still fascinated by these little guys. Now I just wish I had a garden and could grow them myself. Maybe others have seen these before and I am just completely behind the times. I think they are amazing the only problem was they were rather expensive so I have been enjoying eating then one by one…although they would be completely awesome in a salad. 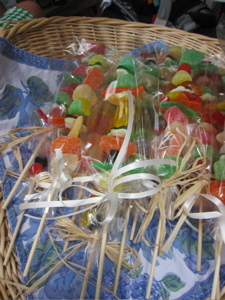 These were bright, colorful, and looked so adorable all individually wrapped displayed in a basket. My only disappointment was that I only got one! 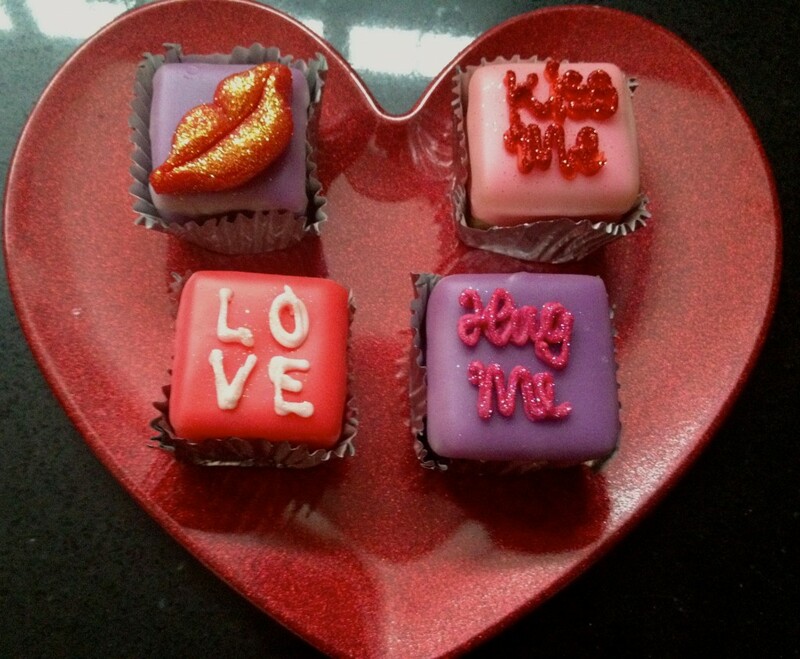 They were homemade but totally looked store bought! I was in South Carolina last week and when I was on the highway, I saw baskets of peaches on a truck. I was tickled pink about this sighting because I had totally forgotten I was in peach territory. Of course now I was on the lookout for where I could buy my own basket of peaches. Alas right before heading back to the airport I found a farmers markets and literally got a basket of peaches and took them back with me to NYC. Now what to do with my peaches! I didnâ€™t want to make a cobbler had done that last week with some strawberries and rhubarb. 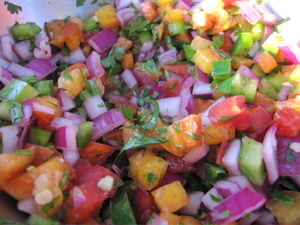 Salsa is what came to mind. I was also told that grilled peaches were greatâ€¦but I didnâ€™t have access to a grill. Mix all of the ingredients together and ready to serve. What I loved were all the colors together, I thought it looked so fresh and absolutely beautiful. I was speaking to my Aunt, that knows every household trick. I was telling her how last year there was clearly a party in my clothing, that I was very upset not to have been invited too. All of my sweater, plants, dresses were eaten by moths. I thought I had been so cautious the year before cleaning, buying all the moth balls, packing in air tight containers etc. Well, this year I am going about it a little different. I am using a trick that my Aunt told me is how my grandmother would get rid of months. 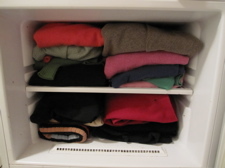 She would FREEZE her clothing in order to kill all the eggs before packing away. I found this was a great way to clean out my freezer too. I also will be getting some of the air tight bags, along with placing moth balls, peppercorn (another supposed trick to prevent) and have everything cleaned beforehand. Iâ€™ll inform in the fall how this all worked out. I have high hopes this year!